Agaricus blazei Murrill is a mushroom named by the American naturalist W.A. Murrill. In Brazil, Agaricus is called “ Cogmelo de Deus. “ . It means “ Mushroom of God .”. In Japan, they called it “ Himematutake.” . It means “ pretty little girl Mushroom.”. Because it looks just like a cute girl's head ( hair style ). 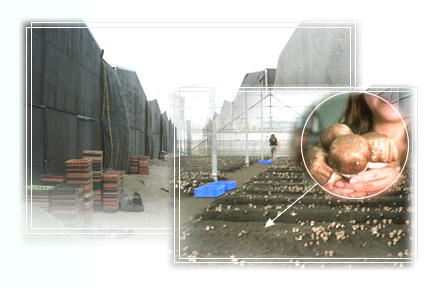 Now we have our farm of Agaricus blazei Murill, cultivated it in a computerized green house and supervised by many researchers and Professors in South Taiwan. The climatic conditions in Taiwan is as same as that in Piedade, Brazil, include temperature that soar to 35 degree C during the day and dip to 20 – 25 degree C at night. Researchers from the University of Pennsylvania, U.S.A. started studying Agaricus blazei Murill ( ABM ) in 1965, because they were interested in how it seemed to improve the health of the people who ate it. Agaricus blaze Murill ( ABM ) contains vitamins, minerals, amino acids and polysaccharides ( several forms of beta-glucan ). Polysaccharides have been studied for their health benefits by such organizations as the Armed Forces Radiobiological Institute, Tulane University and the Harvard Medical School. In Japan and Taiwan, it is known and used for its anti-tumor effects, for its anti-viral properties, as a blood sugar moderator, as a cholesterol reducer and an immune system enhancer. Research in the United States, Brazil, German, Japan, Taiwan and China has supported these functions. Agaricus blazei mushroom is widely recognized as an exceptional natural supplement for its claimed anti-cancer and immunity enhancing effects, to the point where it is used for AIDS treatment too. In Japan, intensive research has been done with guinea pigs reveal that the mushroom prevents cancer development 99.4% and cures cancer 90.0%. Now, several active ingredients have been identified. Several research studies show that Agaricus blazei has anti-tumor activity in mammals. 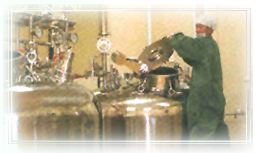 The polysaccharides contained in Agaricus vitalizes production of interferon and interleukin in small animals. This effect indirectly functions to destroy or prevent the proliferation of cancer cell via a cytokine inducing effect. The report on the anti-cancer effect of Agaricus was released at the general convention of Japan Cancer Association in 1980. Most of the cancer research on Agaricus has been done on the high level of Beta ( 1, 3 ) D-glucan and Beta ( 1, 6 ) D-glucan protein compounds it contains, however, this powerful immune-enhancing mushroom contains a number of additional tumor-fighting components ! 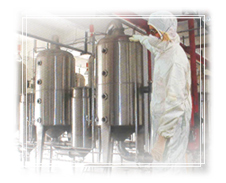 These include : ribonucleic acid protein compounds, acid heteroglucan, xyloglucan, lectin, etc.. Agaricus contains large amount of non digestive dietary fiber that absorb cancerous materials in our body and discharge away from our system. Agaricus can also be used as a complement to radiation or chemical therapy to prevent radiation damage and lessen the side effects. Agaricus help the body to adapt to any form of physical or emotional stress, regulate endocrine functions and bring itself into balance. 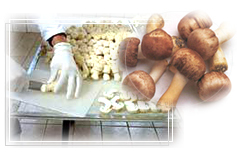 Agaricus may also prove beneficial in the prevention or treatment of Chronic Fatigue Syndrome. Laboratory studies conducted at the U.S. National Cancer Institute, and the Japan National Institutes of Health, showed that Agaricus mushroom Extract kill the Human Immunodeficiency Virus ( HIV ) and enhance the activity of T-helper cells. Reasearchs have also observed improvement in individuals using Agaricus blazei Murill and other mushrooms in individuals with various antoimmune conditions such as rheumatoid arthritis, diabetes, Lupus, atopic dermatitis and others. Preliminary research and direct therapeutic observation indicates that Agaricus may be helpful in lowering blood glucose levels and preventing or treating diabetes. The Beta ( 1,3 ) D-glucan and Beta ( 1,6 ) D-glucan protein compounds, ribonucleic acid protein compounds help reduce elevated blood glucose. Agaricus contains Vitamin B1 and B2 but also contains large amounts of ergosterol, which would be converted to Vitamin D2 when it is dried in the sun or heated in a mechanical drying process. Vitamin D2 has positive effects to lessen the danger of bone loss. Digestive enzymes such as amylase trypsin martase and the protease contained in Agaricus blazei murill and other mushrooms also enhance digestion. The beta glucan content and other agents that speed healing in Agaricus blazei Murill make it excellent to help heal rashes, blemishes, damaged skin and other such imperfections. Some beta glucan products are available which are designed to reduce the signs of aging. Wrinkles are essentially the result of damage to collagen tissues under the skin surface. Bata glucam may help by encouraging resurfacing by speeding skin cell renewal. 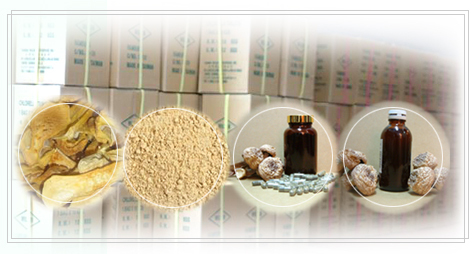 Now we can offer you with Gold grade Agaricus are : Half Slice Dried, Extract Powder, Extract Liquid, Extract Capsule, Agaricus Mixed Tea in a bulk packing. If you are interesting in this nice business, please feel free to contact us.